"Buffy" loss takes a bite out of WB"
HOLLYWOOD (Variety) - Losing "Buffy the Vampire Slayer" won't kill the WB -- but it's gonna sting. While the 20th Century Fox TV-produced series isn't the WB's top-rated show -- that honor belongs to Monday powerhouse "7th Heaven" -- "Buffy" is the anchor of the WB's Tuesday lineup, with an average audience of about 4.5 million viewers. Star Sarah Michelle Gellar is one of the WB's icons. It's too early to say just what the WB will do on Tuesday nights next season. First up, the network must decide whether to keep or kill "Buffy" spinoff "Angel." Ratings-wise, some industry insiders believe "Angel" would suffer without the benefit of a "Buffy" lead-in. The network may also want to make a clean break from the entire "Buffy" franchise. On the other hand, canceling "Angel" would mean giving UPN another hour of successful programming, which the latter network would likely use to build a whole new Tuesday. Assuming "Angel" flies, one leading contender for the 8 p.m. Tuesday slot would be "Smallville," the young Superman series that already has a 13-episode commitment. The show's superhero-as-teen plot mirrors that of early "Buffy." Another possibility would be "Dead Last," which revolves around a "Scooby Doo"-like rock band that solves mysteries. It also has a 13-episode order. In addition to its Tuesday problem, the WB will have other holes to plug next season. On Mondays, "Roswell" was all but dead before the "Buffy" move. It's now buried. On Fridays, the WB will have to fill an hour left by the likely cancellation of teen drama "Popular." The WB will also need at least another hour of programming on Sunday, and quite possibly two hours. 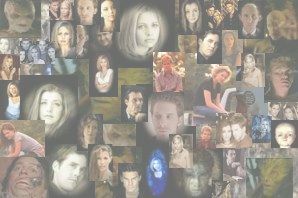 Perhaps most importantly, losing "Buffy" means losing the WB's most-praised series. Last year, the series snagged Emmy and Golden Globe nods and made the 10-best lists of critics from Time, TV Guide and USA Today. While plaudits don't always equal ratings, the WB has used praise for "Buffy" -- and other shows, including newcomer "Gilmore Girls" -- to build a brand as a home for quality young adult drama. That mission now gets a bit tougher. "Buffy swoops onto new network"
Cult television series Buffy the Vampire Slayer is to switch networks in the US for its next series. The programme has spent the last five years on the Warner Brothers network, The WB, but will switch to UPN, a rival youth-orientated network. The New York Times reports that UPN will pay Fox TV, which makes the programme, about $2.3m (£1.6m) per episode, compared to the $1.8m (£1.2m) offered by the WB to keep the show. The defection is thought to be the first time in modern TV history that a hit series has jumped networks solely on financial grounds. UPN has ordered 44 episodes of Buffy under the new agreement. "Creatively, we've had a great partnership with the WB on Buffy the Vampire Slayer over the past five years, and we are grateful for their contributions in making the show a hit," Fox Television President Dana Walden said in a statement. "Unfortunately, the WB did not share our vision or passion for the show's future and, quite simply, UPN did." Buffy, starring Sarah Michelle Gellar, was based on an averagely-successful film but has gone on to become one of the most popular teen programmes in the US. Writer and Buffy creator Joss Whedon said: "I've been dumped by my fat old ex and Prince Charming has come and swept me off my feet. "I'm mostly very excited because I now have a network that cares about my show as opposed to one that insults it." the AOL and Time Warner group. UPN currently broadcasts programmes such as Star Trek Voyager and a derivative of American football, XFL. Buffy is currently WB's third most watched programme. UPN will receive a second major boost when it, as predicted, announces it has the rights to broadcast the new Star Trek series, thought to be called Enterprise. A statement from WB said: "We gave it [Buffy] our strongest promotional and publicity efforts, established it as a hit and moved it to Tuesday with Dawson's Creek only to make it the company's promotional focus once again." It added that the WB "bought a spin off show, Angel, and scheduled it exactly where Mr Whedon wanted it scheduled, promoted that night heavily, and offered to buy two more years of both shows... and finally offered the highest license fee in our history to renew the program". "We're sorry that this didn't demonstrate to Mr Whedon our utmost respect and commitment to the show," it said. There is also speculation that the spin off programme Angel could also leave WB. "'Buffy,' Moving to UPN, Tries to Be WB Slayer"
In a rare case of a hit show leaving one broadcast network for another, "Buffy the Vampire Slayer," a program that was crucial to the original success of the WB network, will move to UPN, its fiercest rival. The move could prove to be a real blow to the WB network, owned by AOL Time Warner, and could be a boon to UPN, which is owned by Viacom Inc. and has struggled some to gain a solid foothold in prime time. "Buffy" is produced by 20th Century Fox Television, which is part of the News Corporation. News Corporation also owns the Fox broadcast network and will own several UPN affiliates once its agreement to buy the group of stations owned by Chris- Craft Inc. is completed. That is expected to happen within the next couple of months. Also, Rupert Murdoch, the chairman and chief executive of News Corporation, is believed to be interested in buying a piece of UPN upon the completion of that deal. Fox's decision to move "Buffy" to the WB's bitter rival exacerbated growing tensions between the network and the Fox studio, which also provides WB with "Roswell" and the "Buffy" spin-off, "Angel." In a statement released last night, WB said, "20th Television has made an inauspicious decision for the television industry by taking one of their own programs off of a nonaffiliated network and placing it on a network in which they have a large vested interest." But executives at the Fox studio said that the purchase of "Buffy" was about who would pay most for the program. "If News Corporation didn't own a single UPN station we would have made the exact same deal," said Sandy Grushow, the chairman of the Fox Television Entertainment Group. "We believe that there is enormous upside potential at UPN and given their passion for the show, given their commitment for the show, we believe they have every opportunity to raise the bar for Buffy." Fox said that UPN had ordered 44 episodes of "Buffy," to be shown over the course of two years. Terms of the deal were not disclosed last night, but people close to the talks said that UPN would pay on the order of $2.3 million an episode. In a statement, Dean Valentine, the UPN chief executive, said the acquisition of "Buffy" would start a new era "in UPN's life and direction." The move is the ultimate outcome of a corporate game of chicken between the two sides that highlighted the new realities in Hollywood as its bigger players continue to consolidate in ways that create fragile partnerships. "Buffy the Vampire Slayer" is a defining program for the WB network. Watched by 4.4 million people each week, it revolves around the adventures of Buffy, a teenager born with vampire-slaying powers. The role is played by Sarah Michelle Gellar. The program has been credited with making WB what it is today - a leading network for young women. The network boasts a larger overall prime-time audience than UPN, which is geared more toward young men. Both networks started in 1995 as smaller alternatives to the large broadcast networks. Given "Buffy's" success, 20th Century Fox had said that it wanted far more money from WB if it would renew its license agreement for the show, which expires at the end of this television season. It is said to be currently paying $1 million an episode. In return for renewing the rights, Fox had been asking for more than $2 million, citing the program's continued ratings strength and high production costs. WB's chief executive, Jamie Kellner, had said that Fox was asking for too much. The network ultimately offered $1.8 million an episode. But Mr. Kellner appeared to have the Fox studio pinned into a corner. The most likely place for the program other than WB appeared to be the Fox broadcasting network. But if the Fox television studio had sold the program to its direct corporate sibling it could have sent a message that it would be willing to steal a show when it became a success. That could make the rival networks wary of doing business with the studio. Besides the higher price from UPN, the deal has the advantage of helping News Corporation - by aiding a network with which it is affiliated - without making the company look as heavy-handed as it would if the show had been sold to the Fox network. "Buffy" will clearly help UPN. Perhaps best known for the World Wrestling Federation's "Smackdown" on Thursday nights, the network has been in need of a hit. By having "Buffy," UPN is expected to have new power with other producers in Hollywood. UPN could be helped further if WB chooses to let go of "Angel," in which case UPN would pick it up. It is unclear how much losing "Buffy" will hurt WB. Stacey Lynn Koerner, a media analyst at TN Media, said it might not suffer as much as might be expected. The network still has strong contenders in "Felicity" "7th Heaven" and "Gilmore Girls," she said.